This audio book is intended for everyone who wants to wake up healthier, happier and more vital, every single day. While asleep, the autonomic nervous system is programmed to detox and de-stress the body, to regenerate, to vitalize and to eliminate waste materials and micro-organisms. Sleeping well has mainly to do with the quality of sleep, and much less with the number of hours you sleep. 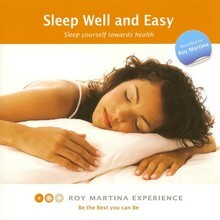 Roy Martina has researched how we can benefit the most from our sleep. He claims that ‘sleeping effectively’ can help us to prevent illness and burn-out, or to recover from it. By listening to this audio book before you go to sleep, you more easily cross the magic border to dreamland. You sink into a deep peaceful state, and you recover from all tension, stress, emotions, worries, irritations, frustrations, sadness, anger, disappointments, hurt, pain and insecurities. Listening regularly will make you recover better, and recuperate from all negative influences in your daily life. This is how you sleep yourself towards health.